Burial at Hill Cemetery, Oshtemo Township. A luncheon will follow the burial in the church hall. This fund will help Rusty's grandchildren. In lieu of flowers, please consider making a memorial contribution. Loving, generous, and kind, Rusty Stafford lived a life rich in family and friends. A devoted husband, father, grandfather, and friend, Rusty welcomed everyone into his heart and embraced all people as friends. Rusty valued both hard work and the importance of play. He met each day with an unwavering commitment to getting things right and inspiring joy along the way.  In Rusty’s good company, life’s hardships were lessened, and blessings were doubled. While his days with us were far too few, the lasting gifts of his great life will long live in the hearts of all who were blessed to know him. As the Civil Rights movement gathered momentum and the nation continued to invest in its goal of putting a man on the moon, 1963 was a year of many changes. American homes were filled with the sounds of the Beatles and the sense of loyalty inspired by its favorite dog, Lassie. Nowhere was there more hope for the future than in the home of Sheila and Robert Stafford Sr. as they welcomed their son Rusty into their hearts and home on February 22nd. The youngest of the Staffords’ three sons, Rusty grew up in a very active home where he was both the baby of the family and the “favorite”. 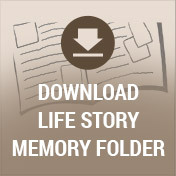 Along with older brothers Bob and Randy, Rusty enjoyed a childhood rooted in family values and a love of the outdoors. Despite the watchful eye of their mother, the boys found creative ways to find adventure on the family’s property on 2nd Street. Family vacations centered around camping “Up North” in Baldwin; many an hour was spent fishing, swimming, and sitting around the campfire. As a teen, Rusty worked at Ridgeview and Thornapple Creek golf courses. Though not the best golfer around, he enjoyed playing the game. Rusty attended Mattawan High School where he played football and met the love of his life, Tammy Munting. As a senior, Rusty had the good fortune of being the same accounting class as Tammy who was a year younger. Instantly smitten, Rusty often found himself in need of Tammy’s help with classwork. His true motives were more than obvious to their teacher Mr. Throop who finally implored upon the young man, "Would you just ask her out?” Mr. Throop’s plea proved just the nudge Rusty needed, and soon the young number-crunchers were an official couple. 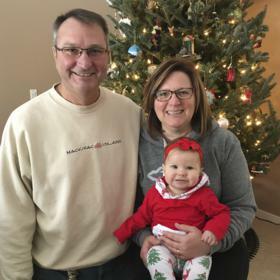 After graduating with the class of 1981, Rusty attended Davenport College in Grand Rapids where he earned his associate’s degree. 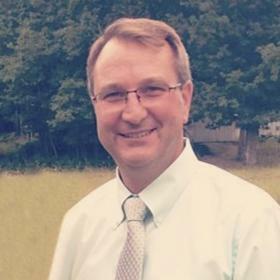 In the spring of 1986, Rusty graduated from WMU with a bachelor’s degree in Business Administration. 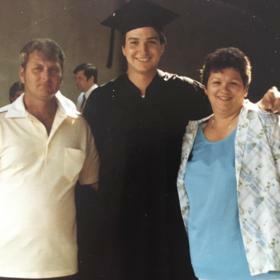 While earning his degrees, Rusty worked at Timber Ridge Ski area in the ski shop and as a Petroleum Distributor for several local gas stations. On December 13, 1986, Rusty and Tammy married at St. John Bosco Catholic Church in Mattawan. After celebrating their marriage with family and friends, the happy couple traveled by train to Copper Mountain in Colorado for their honeymoon. Rusty’s first job was at Grand Rapids Asphalt. After living in GR for a year, he transferred to Globe Construction in Kalamazoo. Rusty worked in management at Michigan Paving & Materials Co. (formerly Globe Construction) for more than 20 years. For the past five years, Rusty worked in management at Rieth - Riley Construction. A dynamic leader, Rusty loved his work. He led with kindness and compassion as well as a commitment to excellence. He never asked for more than he was willing to give and was quick to lend a hand. A natural people-person, Rusty never met a stranger. With a seemingly endless breadth of knowledge, he knew how to connect with everyone instantly. He listened with respect, was a great problem solver, and always maintained a commitment to doing things right. As a result, he was an excellent salesman and manager. While work always afforded Rusty a deep sense of satisfaction, nothing proved more fulfilling than being a husband and father. His daughters, Courtney and Chelsea, were truly his greatest joy. With Tammy at his side, Rusty reveled in fatherhood. He loved to read books to the girls and making up words to songs just to be funny. He never missed a performance or sporting event and often served as a classroom volunteer during the winter months when work was slow. The girls’ biggest fan, he was very involved, he even helped build the sets for the school musicals. He passed along his love for the slopes, teaching them both to ski, and many vacations were taken out west to explore the Rockies together on skis. An undauntable stand for their greatness, Rusty consistently reflected his daughters’ gold and cheered on each of their endeavors. He also showed them in the way he loved their mother how a good woman should be treated by her beloved. Fiscally conservative and extremely talented, Rusty built his family two houses. The last has been their home since 1999. With great care and creativity, Rusty quite literally poured himself into every inch of the houses, ensuring not only their quality but a sense of warmth and welcome that reflected his very heart. It was important to Rusty that the Stafford home be a safe harbor for all. He had a strict open-door policy that welcomed anyone and everyone. As a result, he was a dad to more than just his daughters. Rusty believed in the power of tradition and carefully created many for his family. The girls’ birthdays were marked by Rusty’s special cakes that took the shape of the year’s favorite characters. 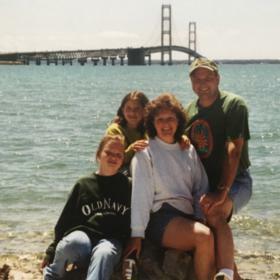 Vacations to Mackinac Island were easily one of the family’s favorites. The memories of their time on the island were so treasured, Courtney had her wedding there in the summer of 2015. Spending a week in South Haven during the summer always made for good times, as did snowmobiling Up North, and Rusty teaching everyone to drive a stick shift in his 1979 VW Beetle convertible. Whether it be the ritual of taking hours to pick the perfect Christmas tree the Saturday after Thanksgiving (he liked a good top! ), Friday night pizza, or family game night, Rusty possessed a natural capacity for making the ordinary extraordinary. Sunday dinners were sacred affairs often involving the use of his trusty grill or smoker. He cooked the meal with enthusiasm saying it would be ready by 5 pm when in fact they rarely ate before 9 pm. Even dog Zory was a part of a very special tradition. Every Sunday morning, Rusty would ask his canine companion, “You want to go get the paper?” Soon the two pals were meandering down the drive together to get the day’s news and return for coffee with Tammy on the front porch. As his daughters grew into adulthood, Rusty made sure they were prepared for the world. With his signature knack for making moments special, he made tool boxes and car kits for each of them. He was also their best lunch and dinner date--as evidenced by his recent drive up to Grand Rapids to see Chelsea, check the oil in her car, and take her to dinner. 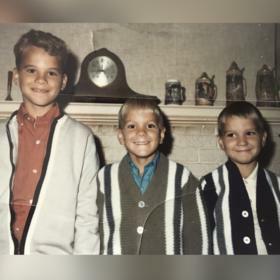 Regardless of their becoming adults, Rusty continued to be the calm voice they turned to when they needed advice or the reminder that they were enough. The love for the outdoors that he experienced as a child stayed with Rusty his entire life. He loved his 18 acres, fondly dubbing them “Rusty Acres” when they camped on it. He took great pleasure in tinkering and having the family over for S’Mores and camper pies on what inevitably would turn out to be ridiculously hot nights. Never tiring of Nature’s splendor, Rusty frequently shared his awe with an, “Isn’t this the most beautiful place on Earth?” Recently, Rusty found a passion for making maple syrup. Combining his love of the outdoors with his naturally enterprising spirit, his curiosity turned into a a delicious hobby he felt compelled to share. Soon he was selling his labors at the local farmers' markets under the label--Sap Bros. The center of the family, Rusty was an inspiration to many. He was an excellent mentor to his son-in-law respectfully offering wisdom and advice as Brandon started the family business--a business he looked forward to joining in retirement. When his niece asked him to officiate her wedding he took the honor very seriously and became ordained as a minister. With great thought and care, he helped create a beautiful ceremony that radiated in love and joy. Similarly, he lovingly created a special ring ceremony for his daughter Courtney’s wedding that touched, moved, and inspired all who were blessed to share in it. Without a doubt, Rusty was a man who led with his heart. There were no limits to his generosity and he lived each moment as a gift. In so doing, he showed each of us how to do so as well. On the morning of Saturday, November 10th, Rusty suffered a fatal heart attack in the comforts of the home he so lovingly built with his bride. Clearly, the shock of Rusty’s sudden departure leaves us with a sense of uncertainty and profound sadness. While it is impossible to imagine life in the absence of this good man we so cherished, may we find comfort in knowing that the best of his legacy lives on in each of our lives. Each time we make a friend of a stranger, notice the beauty around us, freely give of our time and talents, or share a cup of coffee with our beloved, we keep the bright light of Rusty’s spirit shining. In this way, he will continue to inspire others as he so inspired us. Preceded in death by his mother Sheila, Rusty’s legacy will be proudly carried forward by his true love, Tammy (Munting); his treasured daughters: Courtney (Brandon) Bordner and Chelsea Stafford; his heart’s delight, granddaughter Sadie; and “adopted” family: Michele (Sam) Krygier and their son Beckett “Bucket.” Also carrying his legacy forward are his father, Robert Stafford, Sr.; his brothers: Bob (Lisa) Stafford, Jr. and Randy (Tamra) Stafford; his mother and father-in-law: Sherrie (Tom) Mandigo and Jerry (Sue) Munting; his sister-in-law Deb (Mike) Mortensen; and many cherished nieces and nephews. Visit with family and friends while sharing food and drinks on Thursday, November 15, 2018 from 5:30 – 8 PM where a Scripture Service will be held at 5 PM. Mass of Christian Burial will be celebrated Friday 11 AM at St. John Bosco Church. Burial will take place at Hill Cemetery and a luncheon will follow in the church hall. Please visit his personal webpage at www.betzlerfuneralhome.com where you can share a memory and sign his guest book before coming to the funeral home. In lieu of flowers, memorial contributions may be made to Rusty Stafford Grandchildren Education Fund.